I am trying Red Dragon Wing Begonia as a houseplant this winter. This spring, Ball Horticultural sent me some Dragon Wing Red Begonias to trial in my garden. My sister-in-law had told me that she dug up and potted her wax begonias, wintered them over as houseplants, and replanted them every spring, and this gave me the idea to try the same thing with these larger begonias. I knew we were considering moving so I figured why not pot them up right from the get-go? I planted them three to a twelve-inch pot, and they grew beautifully in the light shade of my Juneberry tree with scarcely any attention from me. It helped that we got regular rainfall this summer because I often forgot they were out there and didn’t water them when I watered my other containers. I had two pots of them, but I only brought one pot in to winter over. It is still blooming like crazy in a western window. The leaves are not looking too happy, which may be due to the adjustment of moving indoors. Or it could be my erratic watering practices (ahem). But it also does reside in the same room as our wood stove. The stove is on the other side of the room, but I’m sure it dries out the air, despite the kettle of water we keep on the stove. If I can keep this begonia alive throughout the winter, I’m hoping to root cuttings and plant them in the window boxes. For now, I am very pleased to see its bright blooms on the many dreary winter days. Blooming flowers inside the new housee is doubly good news. You found a flower that would bloom of course, but even better…you must have a sunny enough spot for it to be happy. That makes for more possibilities of other inside bloomers. The fun begins. Hope you had a Merry Christmas with your whole gang. Mine looked red outdoors, but inside the flowers look more pink, or maybe coral. I checked my photos of them outdoors, and they did indeed look red out in the sun. Interesting . . . I have several begonias which usually overwinter in my garage. Maybe I should bring a few of them in to see if they will bloom. The only one I have inside is one that gets about 6 ft and blooms with these huge Pom poms that last forever. I have had it forever and it just keeps going. Hoping you have a Very Merry Christmas. Thank you, Yael. Merry Christmas to you, too. Can you tell me HOW you get your begonia to bloom? I have had mine since 1986 and It hasn’t bloomed. The woman who gave it to me said to keep it in a very small pot so it will be root bound, then it will bloom. I don’t know what to do. I have almost given up on it. If my begonia wasn’t blooming when I got it, it started soon after. It was intended to be an annual and was originally planted outside. 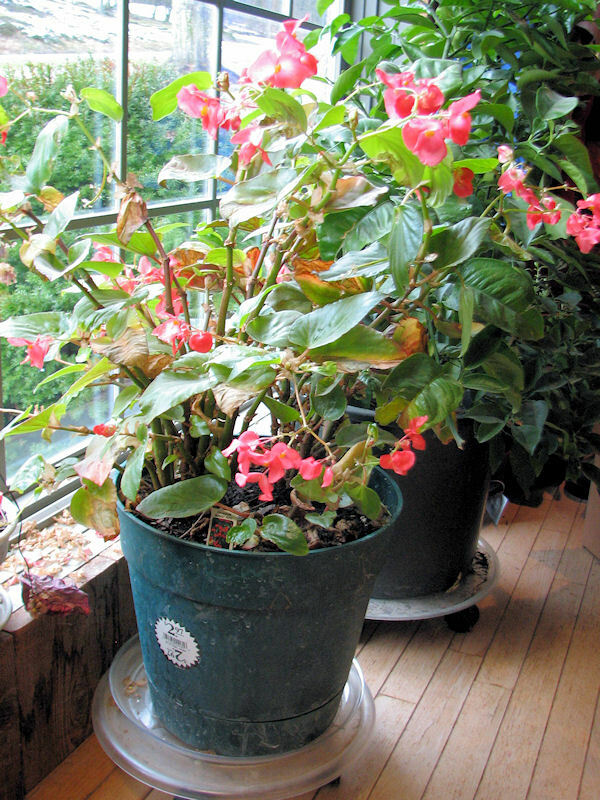 There are so many begonia species and hybrids that it is a good bet that your begonia and mine are not the same plant. My guess is that it needs more sun than it is getting. If you have truly had it since 1986 you are a very patient gardener indeed. I brought several of mine in and have them in sunny windows. The flowers are great and the leaves less so. Glad to see yours and hear of the leaf idea. I am thinking of pinching mine back since they are leggy, but wonder if that would hurt a plant overwintering indoors. Any ideas? Hi, Louise, thanks for commenting. I was thinking mine would eventually get so they just had leaves at the ends of the stems, the others having dropped off. At that point I would cut mine back. In any case, my instinct is to wait until the days are getting longer before doing any cutting or pinching, assuming the plants are in relatively good health. Hello Kathy – how nice to see your windowsill here during the shortest week of winter! I have a very mixed score card on bringing flowering plants in for the winter. I have pretty good luck with traditional foliage houseplants, but every time I find something cool that I want to save for next year, it croaks within a few weeks. I hope you have better luck. Happy GBBD! Begonias are pretty tough. I’ll bet it makes it through the winter. There’s always some leaf fall on plants brought inside. The dragon wing form is so elegant. Those look so cheerful, Kathy, good job! I bet they stay alive to have cuttings taken, too. Begonias are very forgiving. What is better than flowers looking out through the window at snow? I believe I have one of these also. It flowers all year. I hope it stays happy enough Kathy…looks great right now! I brought mine in last winter and am trying to decide if I can gamble on leaving it in the protected patio corner this year. Just being lazy….